Among the populace of the Aztec empire, the line between religion and magic often blurred in day to day life. While the priestly class held a great amount of power in mediating between the people and the gods, and by extension had a powerful influence on directing orthodoxy, folk practices flourished within the family household. One of these was the practice of offering prayers and desirable substances (often copal incense, tobacco, and sometimes blood) to the lesser spiritual beings inhabiting everything from the trees to the crops to the tools by which people lived. While these animistic entities were less grand than the mighty cosmic lords like Huitzilopochtli and Quetzalcoatl, with their broad power over the universe and the state, these local spirits had their own gifts. This influence carried extra weight for the humble individual due to its intimate proximity — while Tezcatlipoca’s wrath could lay waste to the entire kingdom, the fury of a small farmer’s sole cornfield could prove just as deadly for that individual as his livelihood dried up. In this post, I’ll share with you a set of three of these short folk prayer-spells, collected by the inquisitor Hernando Ruiz de Alarcón in his “Treatise on Heathen Superstitions” in the early 17th century. These incantations were intended to guard a sleeper against evildoers invading his or her home in the night, and to express gratitude in the morning for a safe rest. Note that the supplicant in these prayers is actually praying to the spirits of their bed and their pillow, rather than a more familiar high god like Tlaloc. Incantations are quoted from the excellent English translation of Alarcón by J. Richard Andrews and Ross Hassig. Incidentally, if you can read Spanish, I found a full text copy of the Paso y Tronsco fascimile online at the Biblioteca Virtual Miguel de Cervantes, viewable by clicking HERE. Commentary about each prayer is my own material. Let it be soon, O my jaguar mat, you who lie opening your mouth toward the four directions. You are very thirsty and also hungry. And already the villain who makes fun of people, the one who is a madman, is coming. What is it that he will do to me? Am I not a pauper? I am a worthless person. Do I not go around suffering poverty in the world? The supplicant here calls upon his bed (“jaguar mat”), a mat made of reeds and palm fronds to protect him from the nocturnal sorcerer, the nahual. This particular flavor of witch was greatly feared throughout the region due to his ability to control minds, paralyze, and shapeshift. He was believed to often indulge in robbery like a cat burglar, breaking into homes in the dead of night to bewitch and rob his prey. Sometimes, he would violate and kill his victims. 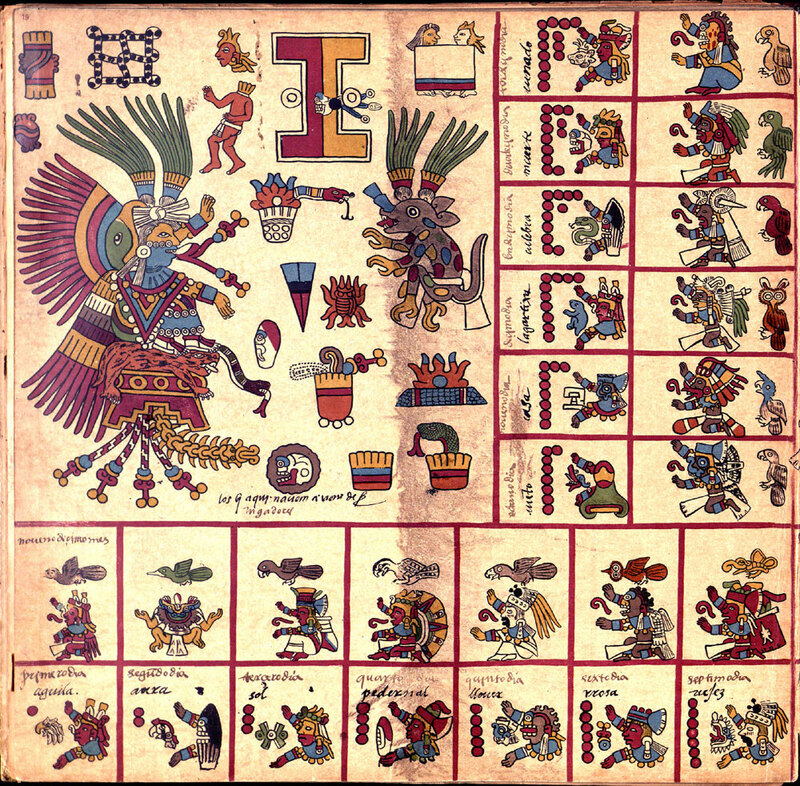 Interestingly, Quetzalcoatl was noted by Sahagún in the Florentine Codex to be the patron of this supernatural lawbreaker. The structure of this prayer is double-layered — the supplicant begins with calling on the spirit of his bed to protect him, but then shifts to make a declaration of his extreme poverty and worthlessness as a robbery target. Perhaps he had in mind a subtle defense here — rather than asking the spirit to try to destroy or disempower the witch, which might be unlikely to work as they were considered to be quite strong, he’s asking it to trick the burglar by convincing him that there’s nothing of value in this house, better go somewhere else. The bed itself is described in an interesting way. It reaches out towards the four directions, thus anchoring it very firmly in physical space, but also possibly linking it to the greater spiritual ecosystem, as a common verbal formula of invoking the whole community of the divine is to call to all the directions and present them with offerings. It also reminds me of the surface of the earth (tlalticpac) which similarly fans out as a flat plane towards the cardinal directions, making the bed a tiny replica of the earthly world. The reference to gaping mouths, hunger, and thirst acknowledges that the spirit of the bed has its own needs and implies that the speaker will attend to them. In the Aztec world, nothing’s free, and a favor requested is a favor that will have to be paid for. Alarcón doesn’t note what offering is given to the mat here, but in other invocations of household objects recorded in the book, tobacco and copal smoke come up repeatedly. Let it be soon, O my jaguar seat, O you who are wide-mouthed towards the four directions. Already you are very thirsty and also hungry. This prayer is the companion of the one discussed above, except directed to the sleeper’s pillow (the “jaguar seat”). Incidentally, you might be wondering why these two objects are named “jaguar.” Andrews and Hassig speculate in their commentary that it may have been inspired by the mottled appearance of the reeds making up the bedding. I think it may be a way of acknowledging that these simple, seemingly-mundane objects house a deeper, supernatural power. The jaguar is a creature of the earth, of the night, and sorcery in Mesoamerican thinking, and in particular is a symbol of Tezcatlipoca. It doesn’t seem like a coincidence to me that a nocturnal symbol is linked to things so intimately tied to sleep and being interacted with in the context of their magical power. The adjective “jaguar” also appears elsewhere in Aztec furniture as the “jaguar seat” of the kings and nobles, which is often used as a symbol of lordly authority. The gods themselves are sometimes drawn sitting on these jaguar thrones, including in the Codex Borbonicus (click to view). Once again, another possible link to ideas of supernatural power and rulership — authority invoked to control another supernatural actor, the dangerous witch. O my jaguar mat, did the villain perhaps come or not? Was he perhaps able to arrive? Was he perhaps able to arrive right up to my blanket? Did he perhaps raise it, lift it up? This final incantation was to be recited when the sleeper awoke safely. He muses about what might have happened while he slumbered. Maybe nothing happened… or maybe a robber tried to attack, coming so close as to peek under the blanket at the defenseless sleeper, but was turned away successfully by the guardian spirits invoked the previous night. Either way, the speaker is safe and sound in the rosy light of dawn, alive to begin another day. To see a short description of a linked site below, just hover your mouse over the link and a tooltip will appear.